When you're driving down the road in Sacramento and your check engine light turns on, this is not a time to panic. But it's also not a time to do nothing. Your check engine light is a warning that your vehicle is giving you, letting you know that something is wrong or something is about to be wrong. 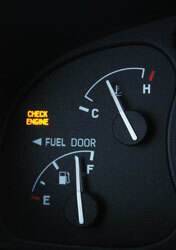 Don't ignore your check engine light! The best thing to do when your check engine warning comes on is to take it to your trusted auto repair shop in Sacramento. We will be able to read the codes and determine what triggered the warning light. Oftentimes when this light turns on it is a warning from your car that something is about to break, and ignoring it could cause that part to break completely requiring a more expensive repair. Bringing your automobile in sooner could save you a lot of hassle and money! Nowadays, automobiles are much more complex and computerized, so you need to make sure that your mechanic is one who knows how to work on newer vehicle models to ensure they are reading your warning lights correctly. Our ASE Certified Technicians have the experience & technology to help. At OK Tire and Automotive, our mechanics are all ASE Certified Technicians who utilize the latest in diagnostic equipment to handle all necessary auto repair and maintenance services. When you bring your vehicle to us with a check engine problem, we can quickly figure out what the issue is, and efficiently repair the problem. In addition, all of our auto repair services are backed by a 24,000 mile/24 month guarantee so you can rest assured that your car trouble will be resolved. We have years of experience at working on all makes and models of foreign and domestic cars, trucks, SUVs, minivans and hybrid vehicles, and always keep up with the latest trends in the car repair industry. It is our duty to make sure your automobile stays safe and reliable to help you get where you need to go each day! OK Tire and Automotive is proud to be your trusted automotive specialist, and is happy to help you with all minor and major repair services that your vehicle may need. So next time your find yourself needing help with your check engine light in Sacramento, CA, don't panic! Simply stop by, give us a call or easily schedule your appointment online. Our friendly automotive service team will be happy to answer all of your questions and get back on the road quickly and safely!